Auburn Ridge on the River offers a unique opportunity for homeowners to have shared access to boat docks on the Biron Flowage section of the Wisconsin River while still enjoying the convenience of Village of Plover living. The Biron Flowage consists of approximately 2000 acres and 14 miles of river between the Whiting and Biron dams. This section of the river offers excellent opportunities for fishing, nature viewing and recreational water sport activities. Auburn Ridge on the River is a new single family residential development in the Village of Plover, Portage County, Wisconsin. The development is located north of River Drive in the western section of the Village, adjacent to Classic Development’s Auburn Ridge subdivision. Auburn Ridge on the River includes over 3000 feet of frontage on the Wisconsin River and over 50 acres of “conservancy area” that is owned collectively by the property owners of the development. The project will consist of 39 single family residential home sites in a beautiful setting of wooded upland property. 20 of the lots are premier properties, located on the ridge with panoramic views overlooking the conservancy area and allowing for construction of homes with walk-out basements. Auburn Ridge on the River also features a multiuse trail system that provides opportunities for walking, hiking, jogging and bicycling throughout the development and the conservancy area. 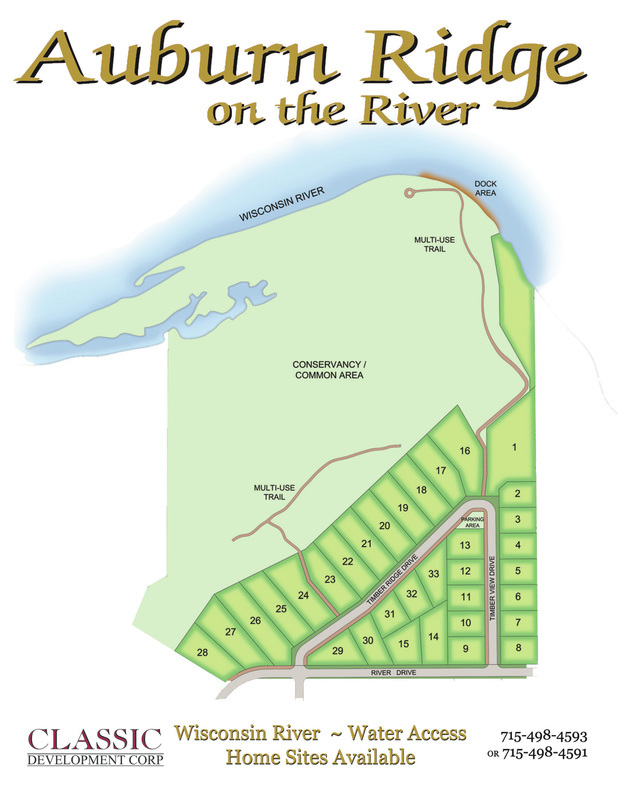 The trail system provides a link from the home sites to the common dock area on the Wisconsin River and residents are able to utilize golf carts to access the dock area from their homes. Auburn Ridge on the River includes protective covenants to provide for compatible development throughout the project and for protection of each homeowner’s investment. The property owners are also co-owners of the Auburn Ridge on the River Homeowners Association that owns and maintains the common ownership areas of the project including the conservancy area, docks, parking area and trail system. For more information including lot availability and pricing please contact Erbes Construction at 715-344-7499 or visit their website at www.erbesconstruction.com.